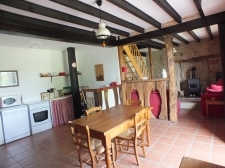 Peyrenegre Gites, 3 Country Cottages With Heated Pool. 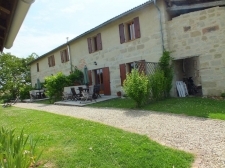 Peyrenegre Gites has three Gites to offer and is Situated in the undiscovered Lot-et-Garonne, 14km from Marmande, Peyren;¨gre is situated at the end of a quiet no-through road and offers you the opportunity to relax and recharge your batteries in the heart of the countryside. Panoramic views over cornfields, sunflower fields and the hazelnut trees for which this area is famous. 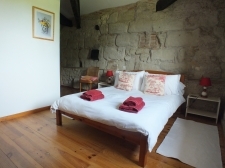 Well equipped and comfortably furnished the cottages retain the characteristic features of this 150 year old stone farmhouse Whether you are a couple, a family or a larger group we can organise the accommodation to meet your needs. The 10m x 4.5m heated pool has salt water filtration and is well equipped with wooden sun-beds and pool games. A BBQ, ping-pong table, a variety of outdoor games and trampoline are provided. All bed linen, towels and pool towels are provided. We provide baby equipment including cots and we welcome well behaved pets. Free use of the sauna, hot tub and 4 adult bikes. Close to several Bastide towns and the wine growing regions.